Was born and raised in Budapest, Hungary. His love for art surfaced early on in his childhood when Ferenc filled all his textbooks with drawings to the frustration of his teachers and parents. He started his career decisively influenced by the internationally known Ernő Zórád’s comics. They were an inspiration to him when he was a child. Later on, as an adult, he received advice and guidance personally from him, which was of great help to the development of his style. Traditional as well as impressionist masters also made significant impact on him. At the beginning, his primary medium was oil. In the last two decades however, his primary medium changed to watercolor, in which he achieved his greatest successes so far. 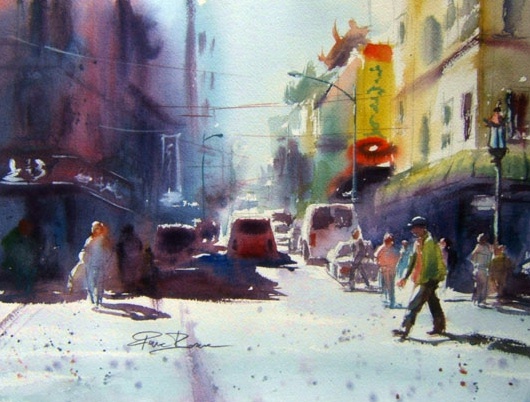 In the United States, he developed his watercolor techniques under the guidance of Marta Szoboszlay. Ferenc’s free-flowing spontaneous style perfectly matches his personality; consequently, he is able to bring out the beautiful characteristics of watercolor. Watching him paint, we are tricked by the effortless brush handling, which makes it look so easy. However, if someone has tried watercolor would know that it is not the case at all. Quite the opposite. Ferenc’s passion continues until this day. He believes that the value of art is not only wonderful to learn and absorb, but worth to share with others. The way he accomplishes that is by teaching and giving demonstrations. His paintings are in private collections in the United States and Europe. 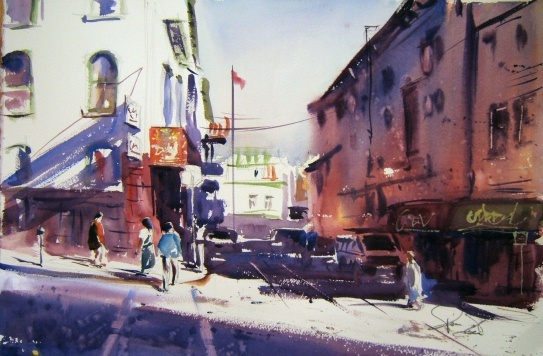 In 2013, he was commissioned to paint this watercolor for the President of the Hungarian Republic . 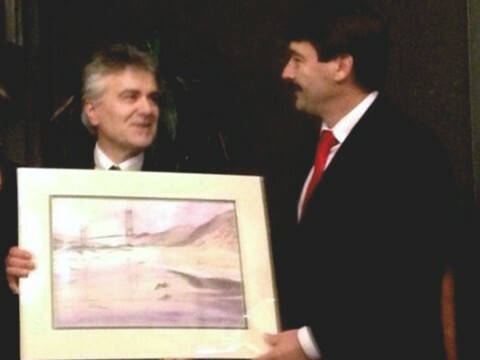 Presentation of the painting to the President of the Hungarian Republic. On Martin Luther King Jr.'s birthday in 2017, Apple CEO Tim Cook joined in to paint Ferenc's mural at Stege Elementary School in Richmond, California. Ferenc exhibits his work locally, nationally and internationally. His work was featured in the millennium issue of the International Artists Magazine Master Painters of the World section as well as the book titled “Paint the town”. Ferenc’s paintings have also won numerous awards. The most recent ones were, “Best of Show” and “ First Place Popular Choice” awards at the Society of Western Artist 63rd annual exhibition. 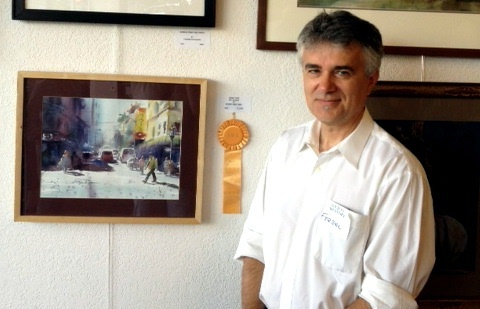 “ First Place Popular Choice” award with his "Chinatown" painting at the Rose Shenson Gallery annual exhibition. Also, the “Creative Catalyst Alliance ” award with the same painting in the juried international exhibition in Colorado . Also featured in the prestigious French art magazine "The Art of Watercolour " and the "International Contemporary Artists" book, vol. VIII in May 2014 . In 2012, Ferenc was also commissioned by Apple Inc. to do a graphic mural. 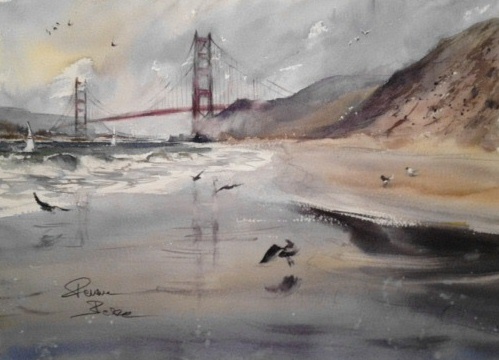 Ferenc is a signature member of the Society of Western Artists art club. He is also an active supporter of different fundraisers, which benefit humanitarian causes, such as the Soroptimist International Organization, Make-A-Wish Foundation, MAP (Moms Against Poverty), Menlo/Atherton school district, Lucile Packard Children’s Hospital and the San Francisco Bay Area Hungarian Scouts.